Disclaimer: Just Happiling was not compensated for sharing this giveaway event, nor was offered a sample of the product described in this post. We are just part of the bloggers helping promote this event to give it more exposure. Nonetheless, all opinions are 100% our own. We've teamed up with an awesome group of bloggers to bring all of our followers the opportunity to win an adorable fluffy prize. If you are a mom-to-be, or know of someone who is about to have a baby, or better yet, you are thinking of cloth diapering, this is a great opportunity to try the system out. If you are already into cloth diapering, because it is super cool, and those fluffy diapers are very cute, then don't hesitate to enter this giveaway too. Remember that sharing is caring, so please, please, pretty please, share with your friends. Even if you don't have a little one in your life, this would be a great gift for a baby shower. Just follow the instructions below, and come back often for daily entries. Good Luck! 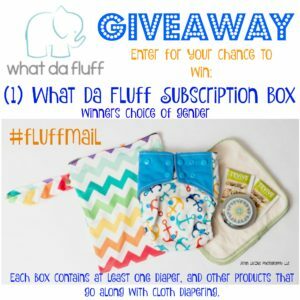 Welcome to the "What Da Fluff Subscription Box" Giveaway! MamatheFox and all participating blogs are not held responsible for sponsors who fail to fulfill their prize obligations. By entering this giveaway you acknowledge that you have read and agreed with the terms and conditions of this giveaway event. You also agree to release any and all social media venues from any liability. Sponsor is the sole responsible for prize fulfillment. This giveaway is open to US residents only. The event starts on 04/22/17 and ends 05/06/17 Midnight EST. One random winner will be chosen on 05/07/17 from those who participated. If the winner does not respond within 24 hours, a new random winner will be chosen. Good Luck.